WMV or Windows Media Video is a kind of video and audio format which is capable of storing the video and audio info within the file. Developed by Microsoft Studios WMV can hold numerous a/v codecs created by Microsoft and run perfectly on the computers with Windows OS. These days a lot of physical file formats like DVD, Blu-Ray and HD are making use of the Windows Media Video format as the default format for storing media information. The sole purpose behind the creating of WMV was to come up with a media format which would be supported by all Microsoft operated devices. Since the WMV format can store a huge amount of audio and video info within a very compact space, this format is ideal for streaming videos over the web. However, WMV format comes with a set of disadvantages which compels the user to convert WMV to AVI, MP4, MOV, and more other formats. Let’s take a look at why you might want to convert your WMV files into other formats. Being a Microsoft Proprietary WMV format isn’t compatible with other operating systems. If you are using Apple or Linux then you would surely need to convert the WMV files in order to play them on your PC. This is precisely why the WMV format didn’t come up as a standard web format in spite of its compact size. WMV lacks the cross platform compatibility which is why it is never an acceptable video format. However there are a few ways to convert your WMV files into other formats like AVI and this in this article we are going to tell you how. You need to use one of the online free video converter programs or software to convert your WMV file into AVI. Let us now take a look at some of the software which can help you convert your WMV files. 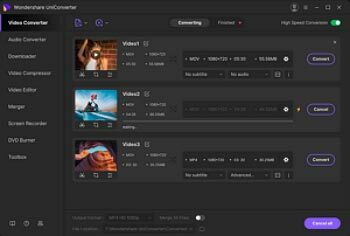 Apowersoft comes with a free, simple and user friendly interface which would allow you to convert your WMV to AVI files with just 3 easy steps. Moreover this online converter will also allow you to choose your own audio and video settings. All you need to do is select the file you wish to convert, select the output setting, hit the start button and you will have your file converted within a few minutes. One of the best features about the Apowersoft converter is that it allows you to convert several videos. Zamzar is yet another popular audio and video converter which supports various different audio and video formats. Zamzar is compatible with both Windows and Mac and don’t need to download any software to convert your WMV file. You just need to visit Zamzar, choose your file, select the format you want to convert you and your file will be converted real quick. However in this online converter you need to provide your email ID so as to receive your converted file. This can be an inconvenience for many of us. Convert files is yet another online tool which is going to help you convert your WMV files into other formats like MP4, AVI, 3GP, DIVX, etc. You will be able to convert the videos on your PC as well as any videos you might have uploaded online. You need to select the output format by clicking the drop down arrow and then hit the convert button. One can also choose to send the download link to their email so that it can be downloaded later. However one major drawback of this online converter is that it takes a long time to download. This website allows the user to convert their WMV files in just a few clicks. The supported formats include AVI, WMV, MOV, MP4, FLV among others. Though this site will allow you to convert your videos for free yet it will set a limit on the number of files you can convert. If you want to know more better WMV to AVI converters , you can refer to the article of How to Convert WMV to AVI Effortlessly >. However, online video conversion comes with a unique set of disadvantages. Firstly you need to wait for hours for your converted videos to download. Moreover some sites take a long time to upload the videos you want to convert. The quality of video you get from online converters is never great. Some of these online video converting sites are not free, which implies you have to dole out a lot of money just to convert your WMV videos. If you are looking for a powerful video and audio converter which would help you convert your video and audio files within a few seconds without compromising on the quality then you should look no further than the Wondershare UniConverter (originally Wondershare Video Converter Ultimate). Honestly speaking, there’s no reason why you should wait for long hours or drain your account to convert your videos when you can just download the Wondershare UniConverter (originally Wondershare Video Converter Ultimate) and try it for free.